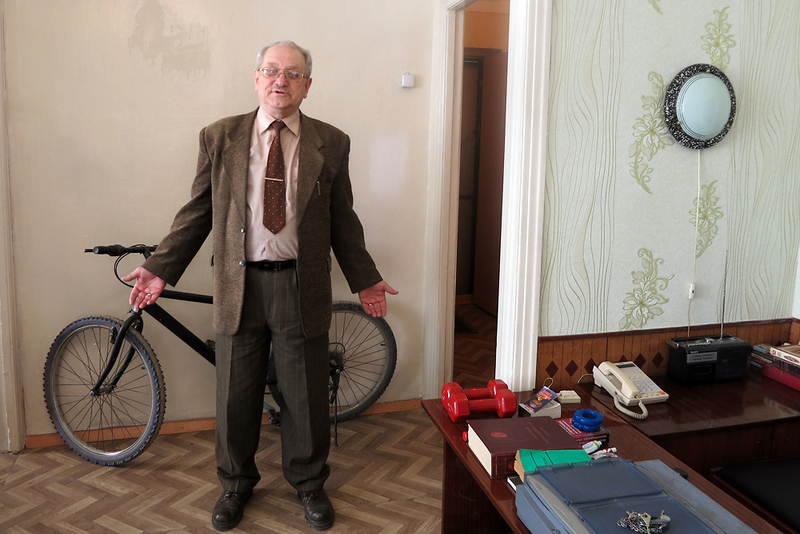 Mild-mannered pensioner Aleksandr Kharlamov does not look like a typical rabble-rouser – but this bespectacled sexagenerarian stands at the center of a furor over freedom of conscience in Kazakhstan. Throughout the post-Soviet era, President Nursultan Nazarbayev’s administration has cast Kazakhstan as a bastion of religious tolerance. Yet, Kharlamov, a staunch atheist, is accused of stoking religious tensions in a Kafkaesque case which could see him jailed for seven years. Kharlamov has already spent six months behind bars, some of it in a psychiatric ward, broadening the controversy over religious freedom into a row over the alleged misuse of psychiatry. Kharlamov denies stoking religious discord, he told EurasiaNet.org in an interview in his hometown of Ridder in the Altay Mountains in northeastern Kazakhstan. Kharlamov, an amiable 63-year-old with a ready laugh and a penchant for philosophical debate, believes Kazakhstan is infringing on his right to believe what he likes and express those beliefs freely – that all religions are “idiocy,” for example. Human rights campaigners who have taken up his case share this view. “Freedom of religion or belief includes the right to criticize other faiths, to criticize all faiths, to criticize a faith, to criticize atheism, to criticize agnostics,” Felix Corley of the Oslo-based Forum 18 religious freedom watchdog told EurasiaNet.org. “Prosecuting people for expressing their views about religion when those views are not designed to incite violence or aggression is an issue that concerns many human rights defenders in Kazakhstan itself and around the world,” Corley added. Kharlamov’s case has been taken up by the UN Human Rights Council and the US State Department, and by international watchdogs like Human Rights Watch and Reporters Without Borders. Kharlamov claims local authorities used his philosophical treatises to trump up a case against him because, as a self-styled crusader against corruption and misconduct, he is a thorn in their side. Kharlamov has certainly ruffled feathers, acquiring a reputation as a gadfly in the process. As well as publishing articles in local newspapers about alleged wrongdoing, he runs an organization – quirkily named Secret Service – offering legal services for defendants who believe their rights are being trampled upon. Contacted by EurasiaNet.org, the prosecutor’s office and the police investigator in charge of Kharlamov’s case declined to discuss it by telephone. Authorities have denied any ulterior motives to the criminal investigation. Local politics aside, Kharlamov’s case has caused an international stir amid a wider debate about freedom of conscience in Kazakhstan, where some 70 percent of the population identifies itself as Muslim and 25 percent as Orthodox Christian. That legislation bans prayer in all state institutions, restricts the circulation of religious literature, and requires all religious groups to acquire state registration. Hundreds of communities have been closed down after being denied registration, or refusing on principle to seek it. The registration requirement creates “legal insecurity which adversely affects [communities’] freedom of religion or belief,” UN rapporteur on religious freedom Heiner Bielefeldt said in April following a visit to Astana. Bielefeldt has called on the government to repeal the registration requirement. Forum 18 documented over 150 fines issued last year under the registration requirement; by March this year 35 people had been fined and seven jailed for short terms. “Kazakhstan's basic approach is to make the exercise of human rights conditional upon state permission, as a means of state control of society, flagrantly breaking its binding international human rights obligations,” Forum 18 stated in a religious freedom survey released in March. Back in Ridder, Kharlamov has no intention of renouncing the public expression of his atheistic beliefs. “Karl Marx was right – religion is opium for the people,” he said, before hurrying off to court to act as public defender for a client.